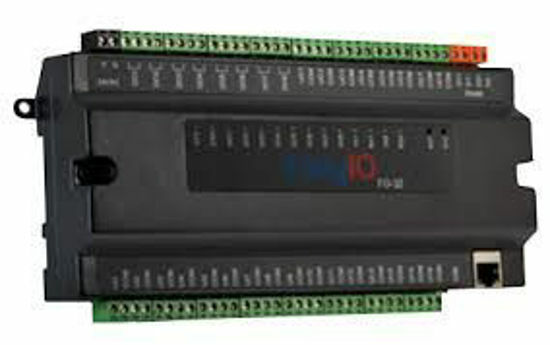 32 Point Sedona, BACnet, Modbus, TCOM Controller, 8 UO, 16 UI, 8 DO, with built in HTML 5 Graphics Server. SD Card Memory expansion, 2 RS 485 ports and full EasyIO Sedona Library for Logging, Control, Scheduling and remote management. The new FG series of Open Automation Controllers from EasyIO are the new range of Internet ready Field Controllers. They comprise of combined Area Controller capabilities and features, as well built in I/O and huge data logging capacity, all packaged as the future solution for the Internet of things in Energy and Building Facility Control. The controller also supports multi concurrent protocols and services such as BACnet, Modbus, TCOM, Web Services and both Server and Client services. This new range complies with the ‘Internet of Things’ by interfacing directly to Cloud Services, without an additional Gateway or Server. To power the application, the FG has a dual ARM processor engine, and also a built-in Web Server (HTML5, PHP, SQL). The FG series change the way that we will deploy Building Automation, especially in multiple Facilities and locations whereby a starter package can be deployed quickly, and cost effectively, without any additional hardware or middleware. We see this range of FG Controllers allowing us and the industry to extend their reach deeper and wider into all kinds of Energy Performance Solutions. Ranging from Retail Stores, Schools, and Residential, Smart Grid and so on. Another exciting feature, is the openness, and its web friendly tools to enable 3rd Party Tools to be deployed in addition to the Workbench that we are all familiar with today. This platform will meet the needs of simple controls requirements and complex HVAC plants, such as Chiller Sequencing and Roof Top Control. Truly a welcome change!